Each set contains three chunky wooden emergency vehicles, a police car, an ambulance and a fire tru.. This steamroller is here to roll out the good roads and flatten the bad! Ask your youngster to show.. Surprise the little ones with these die-cast emergency response rescue patrol sets by Teamsterz. 3 .. 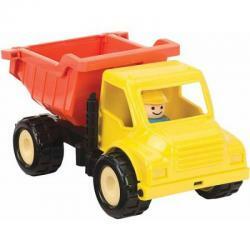 These cute vehicles are the perfect size for small hands to hold and make great gifts.Push and pull.. These cute vehicles are the perfect size for small hands to hold and make great gifts.Promotes hand..
A well thought out garage play set forthose kids that just love cars and racing! With a strong wood.. This beautifully painted wooden transporter truck with trailer and fold down ramp is designed to car..
Flip into action and race down the track!Four cars race from side to side as they race down the ram..